Dar Lighting Babylon 5 light ceiling fitting with twisted arms projecting out from a circular ceiling plate all in a polished chrome finish. 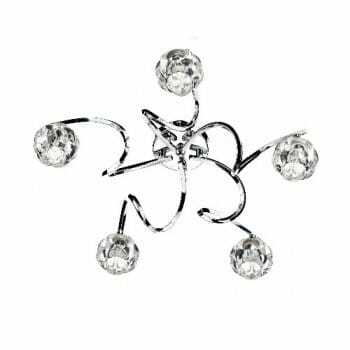 The product code for this Dar ceiling fitting is BAB5450. Open ended crystal globe glass shades complete the overall look of this attractive fitting. A striking collection of lights which also includes a 3 light ceiling fitting and a single light wall fitting. An eye catching addition for any home.